It has all been leading to this. The secrecy surrounding this movie is near unprecedented outside of Star Wars, with some of the actors, such as new Spider-Man, Tom Holland, not even allowed to read the script! As such, this review will remain spoiler-free for those who have yet to see it. Marvel’s Avengers: Infinity War is the 19th instalment of the Marvel Cinematic Universe (MCU) and marks the culmination of 10 years’ worth of storytelling, but does it live up to the hype and build-up? Directed by Captain America: Civil War directors Anthony and Joe Russo, Infinity War sees the mad titan Thanos, played by Josh Brolin, on a quest to find the six infinity stones, colourful gems that house incredible powers, to bend the universe to his will. Only the combined might of Earth’s mightiest heroes; the Avengers and the Guardians of the Galaxy have a chance of stopping him. With eighteen movies prior, there isn’t a lot of character development in this movie, having already established everything before with no need to explain everything. Any casual viewers who haven’t kept up to date will likely be lost with the story, but will definitely enjoy what they see. Each of the characters are well realised and serve their part of the film well. The interactions between each of them is believable and easily on of the highlights, much like both prior Avengers instalments. There is a lot of emotion carried over from the events of Civil War and Thor: Ragnarok, with Robert Downey Jr’s Tony Stark/Iron Man reluctant to call Captain America for help, and Mark Ruffalo’s Bruce Banner/Hulk needing to be caught up on everything that happened on Earth. In total, there are five villains, with four consisting of the Black Order. The Black Order are the children of Thanos and pose a real threat to the heroes, especially Tom Vaughan-Lawlor’s creepy Ebony Maw. They don’t have much development or background, but they are only soldiers meant to serve the true antagonist. 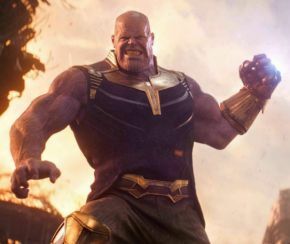 Thanos has been teased in several movies in the MCU since The Avengers (2012), but we finally get the payoff with him being front and centre. In many ways, he is the main character of the movie and the driving force for the Avengers to unite. His motivations are skimmed over, but we see what kind of person he is: a driven individual who absolutely believes he is right. After all, every villain is the hero of their own story. There is even a moment where you can sympathise with him as it becomes apparent that his quest comes at a great cost, making him one of the best villains so far. The story is perfectly told and well balanced, with half of the story taking place across the universe with the Guardians of the Galaxy and Thor, while the rest takes place on Earth in New York, Scotland and Black Panther’s home, Wakanda. It’s a story that has worked well on many action movies, with the bad guy wanting something, while the heroes have to stop them, but unlike many action movies, the characters are hard to invest in, but luckily each of them win over the audience with at least one truly good moment to shine. This being a comic book movie, there are several sequences that need to be enhanced with VFX, which is brought by movie making gurus ILM. The effects are near flawless, with each of the motion capture characters looking fantastic and blend well with the live action. The cities and various planets and locations look incredible and highly detailed, with some incredible wide shots of foreign worlds, proving this is a movie that would have been near-impossible to make 20 years ago. The big and epic set pieces are masterfully crafted, rivalling the Lord of the Rings trilogy in scale, but keeping the focus on the characters, which screenwriters Christopher Markus and Stephen McFeely should be commended for. The score is once again crafted by Ready Player One’s Alan Silvestri, who has created the most iconic Marvel theme with his work on The Avengers. Yet again, he has created a fantastic score that elevates every scene from the dramatic to the emotional. As the culmination of 19 movies, there is a lot riding on this film, and it delivers everything that fans have been waiting to see. There are shocks and surprised that will leave most viewers grinning with joy and gasping in horror. Overall, this is a spectacular movie that delivers on everything it promises and then some. It’s an emotional rollercoaster that will leave you reeling from the events and wanting more. Purple Revolver rating: 5/5. Perfectly balanced and epically brilliant!